Fusing the intricate guitar magic of John Fahey with the beauty of Debussy. 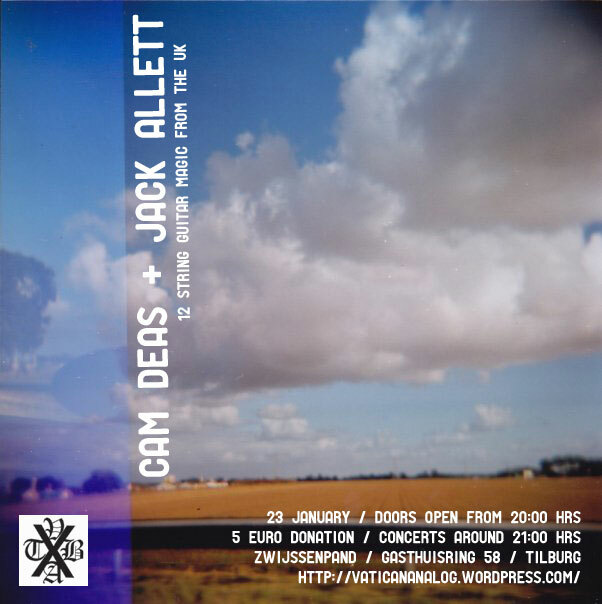 Saturday the 23rd, Jack Allett and Cam Deas from the UK will showcase their impressive technique mixed with cascades of echo and haze in the intimate setting of a living room concert at the Zwijssenpand in Tilburg. 25-year old guitarist Jack Allett (who is also half of Towering Breaker), takes the Takoma School of John Fahey, Robbie Basho et al. as the starting point for his compositions and improvisations, and goes on to incorporate psychedelia, neoclassicism, minimalism, jazz and more into his unique take on modern folk/blues fingerpicking. He has a new album out on Blackest Rainbow Records.